Compared to how it was taught when I wrote this piece, Scap Loading is now being taught differently and, in my opinion, dangerously. As a result, instead of arms being UP at foot plant, you are seeing more and more pitchers whose arms are FLAT at foot plant. The topic of scapular loading (aka, Scapula Loading, Scap Loading, Winged Arm Action, the Inverted W, or simply the "M") has come up in a number of discussions on the message boards that I frequent, and I thought I ought to discuss my view of scapular loading. 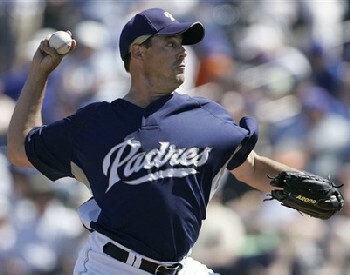 The term "Scapular Loading" -- which in days gone by was described by the term "Proud Chest" -- was coined by Paul Nyman to describe something that high level pitchers often do and that may be related to throwing at a high velocity. 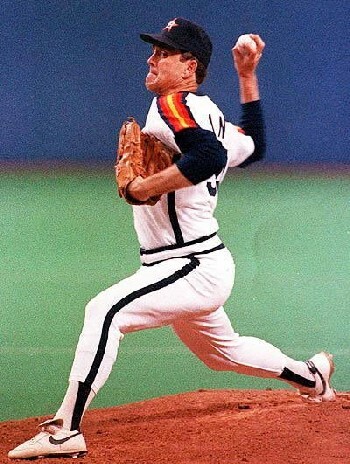 If you look at photos of most major league pitchers, like Nolan Ryan, you will see that at some point in their motion, usually just before their Pitching Arm Side (PAS) forearm is about to pass through the vertical, high-cocked position and their shoulders start to rotate, they take their elbows behind their back and pinch their shoulder blades (or Scapulae) together. 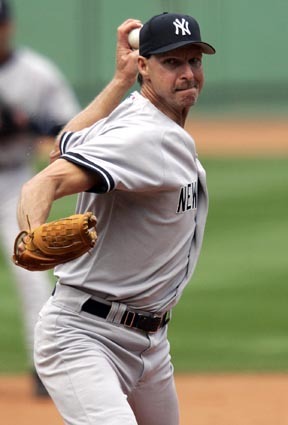 Paul Nyman's theory is that this action helps to load the muscles on both sides of the shoulder and enables a pitcher to throw harder. While I will not disagree that many pitchers seem to do this, I do question whether it has the effect that Paul Nyman thinks it does (due to the relatively small size of the muscles involved). As a result, Scapular Loading is not something that I focus on when teaching or evaluating pitchers. However, I believe that there appears to be a safe way to load one's scaps and an unsafe way to load one's scaps. This piece was written a number of years ago, when I primarily focused on the position and the height of the elbows. While many of the predictions that I made in this piece held up quite well, and encouraged me, the misses -- the fact that some pitchers with high elbows don't get hurt and some pitcher with low elbows do get hurt -- made me realize that I was missing something. As I explain in my piece on the Inverted W, I have since come to realize that the positions that a pitcher's arms pass through are important, but primarily due to their impact on pitchers' Timing. Again the comments below were written several years ago, when the way to scap load was with the arms UP. 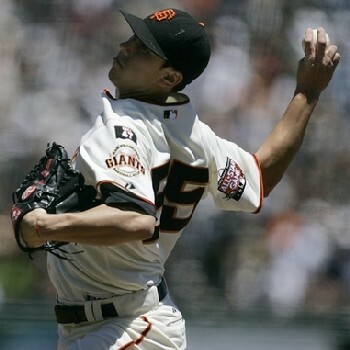 Now, pitchers are scap loading with their arms FLAT, which is a huge problem. In my opinion, the safe way to load one's scaps is to always keep the elbows below the level of the shoulders as Nolan Ryan is doing in the photo above. I believe that this, which I call the "W", reduces the level of the strain that are put on the ligaments that hold the shoulder together and reduces the amount, and force with which, the PAS upper arm externally rotates. 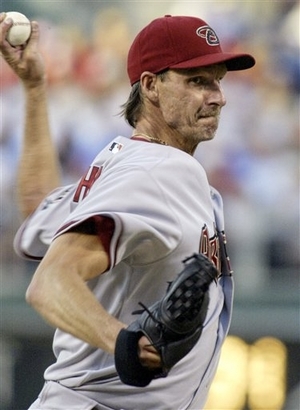 If you look at photos of Randy Johnson, who has had a long, successful career and has been free of shoulder and elbow problems, you will see that he makes the "W" and always keeps his elbows below the level of his shoulders after he breaks his hands. The two photos above of Randy Johnson show exactly what I mean. Notice that while his elbows are behind his back, they are also well below the level of his shoulders. You can see the same thing in the the photo above of Randy Johnson, which is from the same moment but from a different angle. Again, notice that his elbows are behind his back but well below the level of his shoulders during the process of Scapular Loading. 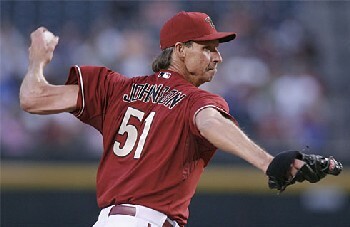 Above is a third view of Randy Johnson from the same moment in time that shows the exact same thing. 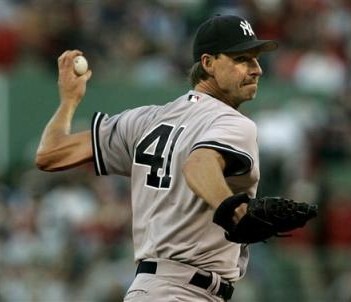 Randy Johnson's elbows are behind his back but below the level of his shoulders. 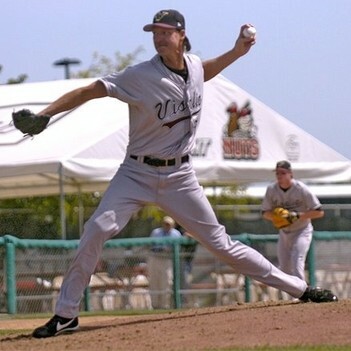 To prove that this is something that Randy Johnson still does, above are four photos of him from early on in the 2007 season. Notice how his PAS elbow always stays below the level of his shoulders. 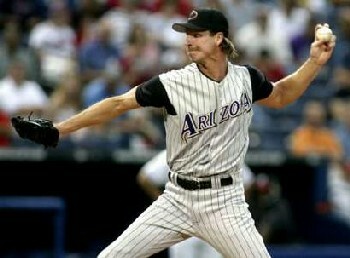 You can see the same thing in the above video clip of Randy Johnson. 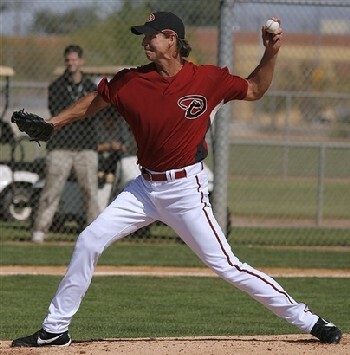 Notice how his PAS elbow always stays below the level of his shoulders until after his PAS forearm has passed through the vertical high-cocked position. His PAS elbow is at the level of his shoulders at the Release Point, but that is normal. For those of you who are not clear what I am talking about, here is a frame from the clip above. 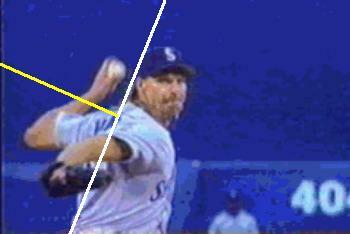 In this frame, the solid white line represents the degree to which Randy Johnson's torso is tilted forward toward 1B. The solid yellow line is this frame represents the level of his shoulders as measured by the Acromial processes. 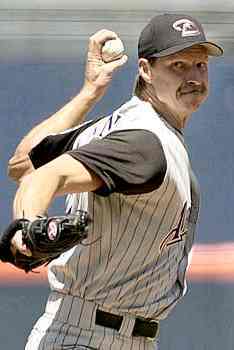 As you can see, as Randy Johnson is at his point of maximum Scapular Loading and his PAS upper arm starts to externally rotate, his PAS elbow is well below the level of his shoulders. Probably 6 to 9 inches by my count. You can see exactly the same "W" pattern in photos of Greg Maddux, another pitcher who has had a long, successful career and who has been free of elbow and shoulder problems. 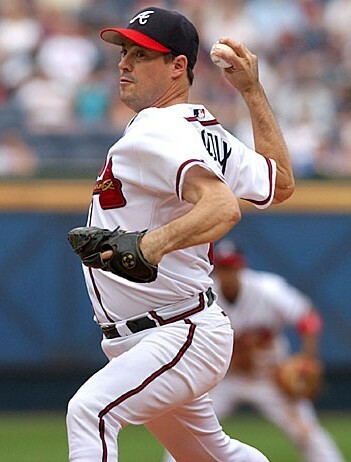 In the photo above of Greg Maddux, notice the same pattern as in the arm action of Randy Johnson. While his elbows are indeed behind his back, they are also well below the level of his shoulders. 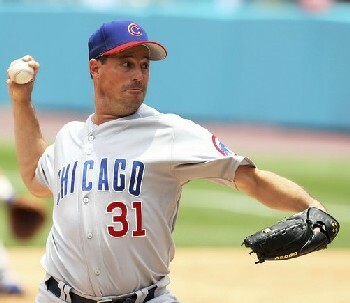 Above is another photo of Greg Maddux taken at almost exactly the same moment. Again, notice that while his elbows are indeed behind his back, they are also well below the level of his shoulders during the process of Scapular Loading. 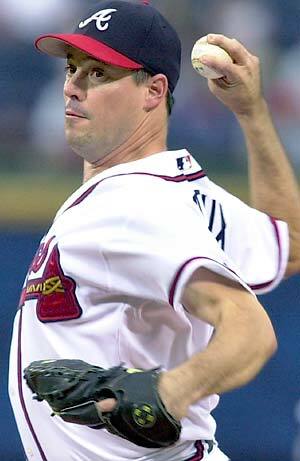 Above is another photo of Greg Maddux taken from a slightly different angle that shows the same thing. Notice that his elbows are behind his back, but well below the level of his shoulders. Above is a third view of Greg Maddux, this time taken from the side. 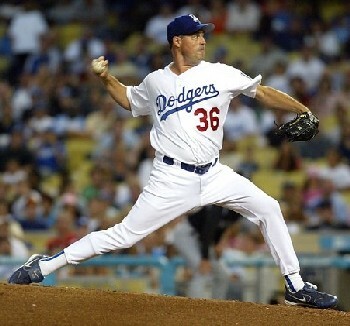 Again, notice how low Greg Maddux's PAS elbow is relative to the level of his shoulders. Above is a recent view of Greg Maddux taken from early May 2007. You can see that he does today what he did back in his days in Atlanta; he keeps his PAS elbow below the level of his shoulders after breaking his hands. Finally, above are two views of Greg Maddux from June 2007 showing how he keeps his elbows below the level of his shoulders during the act of Scapula Loading. 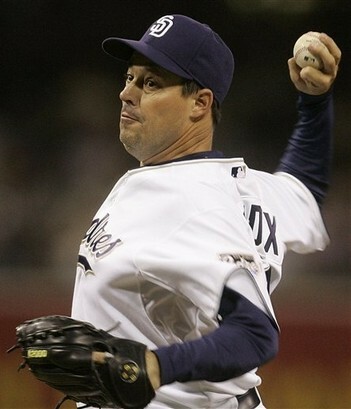 If you look at photos of Roger Clemens, you will see the same "W" form in his arms. Notice in the photo above, that while Roger Clemens' elbows are behind his back, they are also below the level of his shoulders during the process of Scapular Loading. 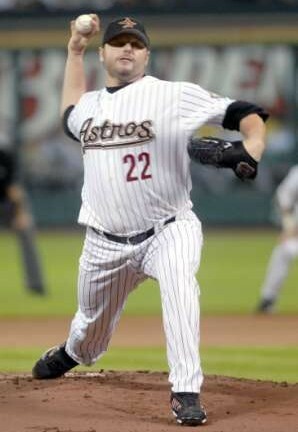 You can see the same thing in this more recent photo of Roger Clemens. His elbows are just behind his back but also just below the level of his shoulders. In this side view of Roger Clemens you can also see that while he is loading his scaps, his elbow never gets above the level of his shoulders. You can see the same "W" pattern in the mechanics of Tom Seaver. 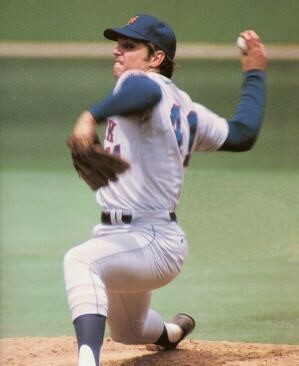 Notice in the photo above of Tom Seaver that his PAS forearm is vertical but his PAS elbow is below the level of his shoulders during the process of Scapular Loading. 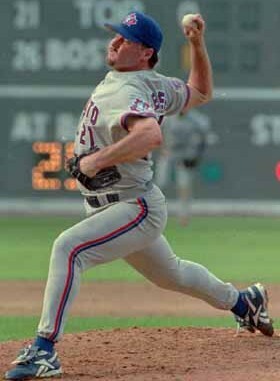 If you compare and contrast how Nolan Ryan, Randy Johnson, Greg Maddux, and Roger Clemens load their scaps with how pitchers with shoulder problems load their scaps, you will often see a difference that I believe is significant. 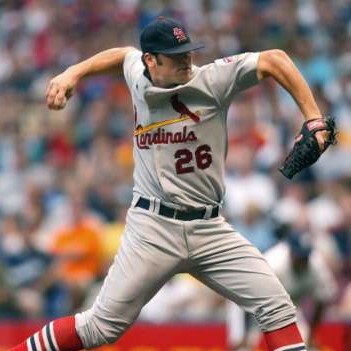 In general, this difference comes down to the position of the PAS elbow; it tends to be much higher around the high-cocked position in pitchers with shoulder problems and their arms form an "M" rather than a "W". I use the term Hyperabduction to describe the general problem of excessive elevation of the PAS elbow. 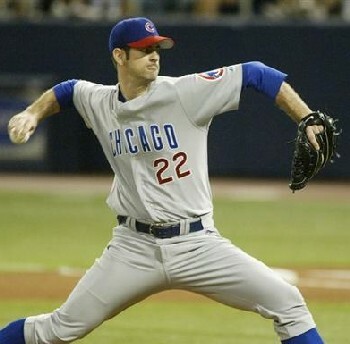 The poster child for the dangerous way to load one's scaps has to be Mark Prior, a pitcher who showed tremendous promise but who has been plagued with elbow and now shoulder problems. The thing to notice in the photo above is how high Mark Prior's PAS elbow is as he starts the process of Scapular Loading. His PAS elbow is several inches above the level of his shoulders and his arms make a clear "M". This stands in sharp contrast to the height of the PAS elbows of Nolan Ryan, Randy Johnson, Greg Maddux, and Roger Clemens. 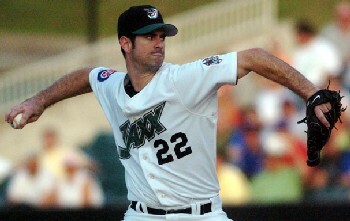 The photo above of Mark Prior shows the same thing. Notice that he is starting to load his scaps, but with his PAS elbow well above, rather than below, the level of his shoulders. If you want to understand the root cause of Mark Prior's problems, then the two pictures above are an excellent starting point. 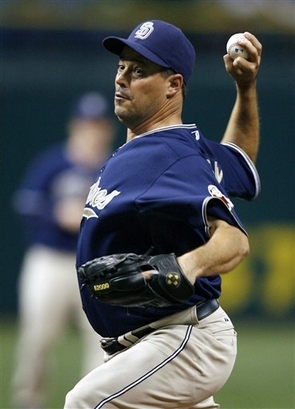 Billy Wagner is another pitcher who has had a series of shoulder problems and who also loads his scaps while his PAS elbow is well above the level of his shoulders. 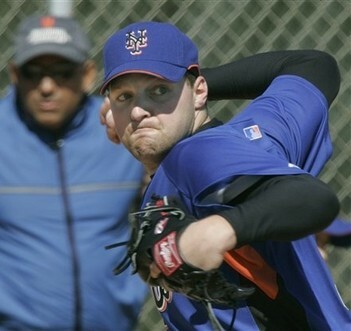 In the photo above, you can see Billy Wagner just starting to load his scaps. You can also see that his PAS elbow is well above the level of his shoulders. You can see the same thing in the photo above of Billy Wagner. Notice how he is starting to load his scaps while his PAS elbow is still quite high relative to the level of his shoulders. Now that I've laid out the basics of my theory, let me make some predictions about the fates of different pitchers based on how they load their scaps. We can then see how my theory holds up over time. Below are photos and comments about pitchers who load their scaps in a way that I think is safe, and who make more of a "W" than an "M". As a result, I believe that these pitchers should be less prone than most to shoulder problems. 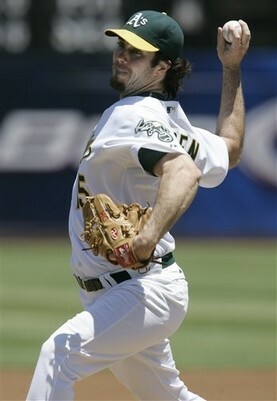 Dan Haren is a pitcher whose arm action I like a lot. 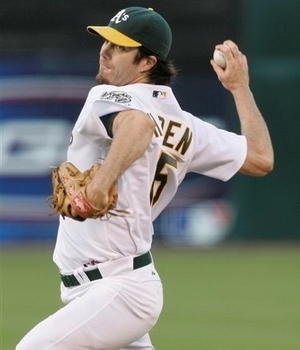 As you can see in the photo above, as he loads his scaps, Dan Haren keeps his PAS elbow below the level of his shoulders, which is good. You can see the same thing in the two photos above of Dan Haren. Also, notice that he is showing the ball to 3B rather than to 2B/CF. The more I see of Dan Haren, the more I rue the day the Cardinals traded him and wish they had traded Anthony Reyes instead. However, I have to hand it to the A's for recognizing his talent. Tim Lincecum is another pitcher who makes the W rather than the M or the Inverted W, and who I think has a chance of being a 20-year guy. While Tim Lincecum hasn't completely fallen apart, he has lost most of the velocity that made him both distinctive and effective. As it turns out, Tim Lincecum has a problem called the Inverted L, which explains where his velocity went. 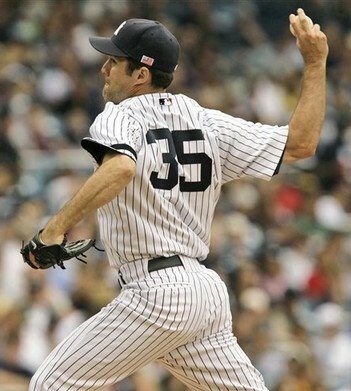 Mike Mussina has had a 17-year career, and I think that his longevity is due in part to thing like his arm action and the fact that he makes the "W". Also, notice that he is showing the ball to 3B rather than to 2B/CF. 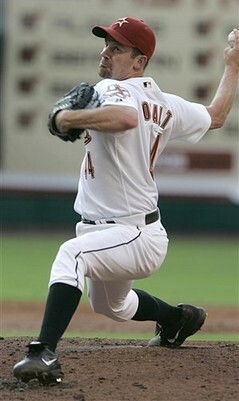 I am a big fan of Roy Oswalt and his arm action in part because he makes the "W". 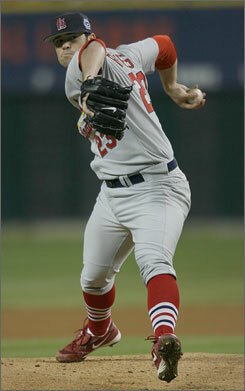 As the photo above of Roy Oswalt shows, as he loads his scaps he keeps his elbows below the level of his shoulders. 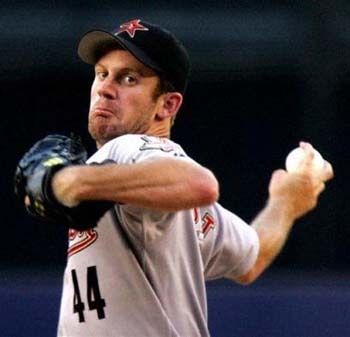 You can see the same thing in the photo above of Roy Oswalt. As he loads his scaps, his elbows are below the level of his shoulders. Also, notice that he is showing the ball to 3B rather than to 2B/CF. 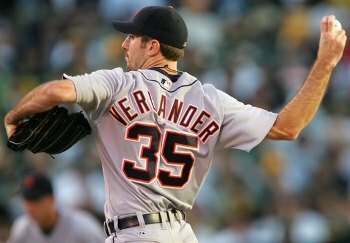 I have long liked the arm action of Justin Verlander, and the photo below illustrates why. Notice the pronounced "W" that he exhibits at the high-cocked position, with his elbows below the level of his shoulders. Also, notice that he is showing the ball to 3B rather than to 2B/CF. 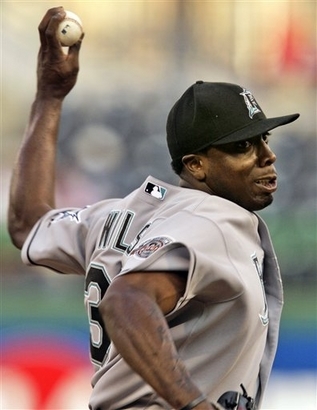 I have some concerns about Dontrelle Willis' arm action, because his PAS elbow gets a little high early on in his delivery. However, as the photo above shows, as his PAS forearm passes through the vertical high-cocked position and he loads his scaps, his elbows are below the level of his shoulders and his arms form more of "W" shape than an "M". Also, notice that he is showing the ball to 1B (since he's a lefty) rather than to 2B/CF. Below are photos of and comments about pitchers who load their scaps in a way that I think increases the likelihood that they will have shoulder problems, especially if they are starting pitchers. Aaron Heilman is another pitcher with what I think is a problematic arm action. 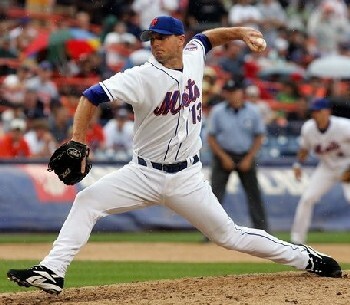 As you can see in the photo above, Aaron Heilman's arm action is very similar to Billy Wagner's. Notice how high his PAS elbow gets relative to the level of his shoulders. 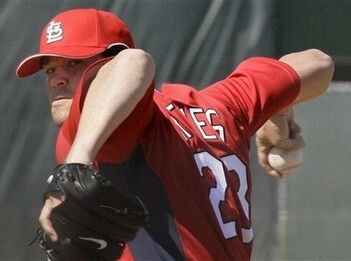 If you are familiar with my work, you know that I have a low opinion of Anthony Reyes of the Cardinals. This is because Anthony Reyes' arm action is very similar to Mark Prior's and he makes a very pronounced "M". As a result, I expect that Anthony Reyes will have many of the same problems as Mark Prior. The photo above shows that Anthony Reyes comes to the same "M" or Inverted W position as Mark Prior, with his PAS elbows both above and behind the level of his shoulders. You can see the same thing going on in the photo above of Anthony Reyes. Notice how high his PAS elbow is relative to the level of his shoulders. You can see the same thing in the photo above of Anthony Reyes. Again, notice the height of his PAS elbow (and his PAS forearm hanging down vertically beneath it).